[Updated below] Milstein Hall, Cornell’s architecture building designed by Rem Koolhaas and OMA, has been experiencing problems with its green (vegetated) roof as far back as 2011, when leaks began to appear both at skylights and at the intersection with the brick wall of adjacent Rand Hall (shown in this video). 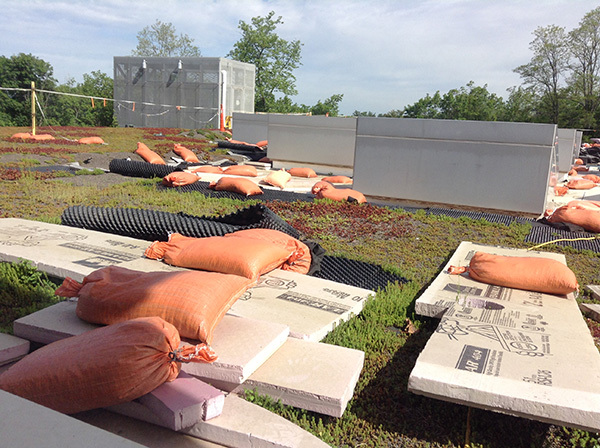 Just about two years ago, in April 2015, an extensive roof repair effort was undertaken, requiring the removal of vegetation and soil medium, as well as rigid insulation panels, in order to examine and repair the roof membrane. For some reason, unknown to me, the green roof was never reassembled, and piles of vegetated soil medium, removed to access the membrane, remain piled up around the edges of the roof along with panels of rigid insulation. XPS Insulation can be exposed to the exterior during normal construction cycles. During that time some fading of color may begin due to UV exposure, and, if exposed for extended periods of time, some degradation or “dusting” of the polystyrene surface may begin. It is best if the product is covered within 60 days to minimize degradation. Once covered, the deterioration stops, and damage is limited to the thin top surface layers of cells. Cells below are generally unharmed and still useful insulation. FOAMULAR Extruded Polystyrene (XPS) Insulation is a thermoplastic material with a maximum service temperature of 165°F. In horizontal applications, FOAMULAR XPS Insulation may experience greater solar exposure than in vertical applications and it may be damaged by heat buildup. Simple precautions during construction can minimize the potential for heat related damage. Install only as much FOAMULAR XPS Insulation as can be covered in the same day. For horizontal applications always turn the print side down so the black print does not show to the sun which may, at times, act as a solar collector and raise the temperature of the foam surface under the print. Some background material can be found in Figure 12 of my Critique of Milstein Hall (Water and Thermal Control). [Updated July 25, 2017] The green roof has not stopped leaking, even after two years. This entry was posted in Architecture, Milstein-Rand-Sibley Hall on May 24, 2017 by jonochshorn.